If you are looking for an inexpensive studio for that photography class, or for your hobby needs, Shutter Starz has the answer: Shutter Starz ProPhotoz Studio Kit. Just look at these features: Filters the light to prevent shadows and reflections, Gives a clean professional backdrop to all items being photographed, Can be lit by flash, fluorescent, quartz, tungsten and flood lights, Made from high quality fabric, Light box size - 20" L x 20" W x 20" H, Comes with 4 different color backgrounds - White, Black, Blue, Red, Background size - 38-1/4" L x 19-1/4" W, Comes with 2 high-intensity lights - 3000K 110V tungsten bulbs, Comes with camera stand - Height adjustable from 11-3/4" to 19", Excellent for field jobs and studio shoots, & Folds flat for easy storage. WHAT IS INCLUDED? SOFT LIGHT BOX: Light weight and easy to set up table top design, the soft light box utilizes a specially woven, heat resistant, 100% nylon fiber mesh diffuser, which delivers uniform illumination while eliminating harsh shadows and reflective glare. Folds up for convenient storage and travel. Set up size: 20 inch x 20 inch x 20 inch. FOUR BACKGROUNDS: Red, White, Blue, and black non reflective polyester fabric background provides for contrast with either dark or light objects, as well as creates an infinite field of depth. HIGH OUTPUT LIGHTS: Two, studio quality, high output 3000K Tungsten lamps for excellent & even color temperature and clarity. Retractable legs allow for hand held use. 8 inch height with 8 ft. power cord. 110v/50w, UL listed. CAMERA STAND: Fully adjustable, high quality, aluminum and steel camera stand eliminates jitters and blurs commonly experienced with hand held shots. Large legs with skid reduction pads keeps stand firmly in place. Neck height ranges from 10 inches with extension up to 18 inches. 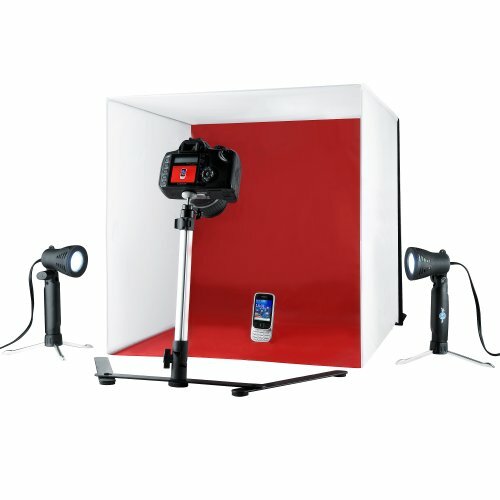 Kit Includes: (1) Tent light box, (1) camera Stand, (2) lights with stand, (4) color backgrounds, (1) carrying case. If you have any questions about this product by Shutter Starz, contact us by completing and submitting the form below. If you are looking for a specif part number, please include it with your message.